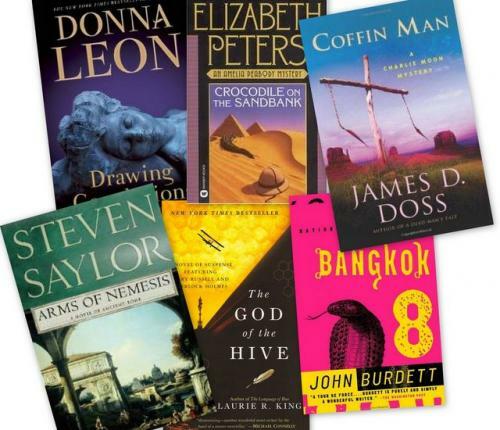 We enjoy reading mysteries, especially when the author introduces characters and places that take me to a place and time that I find intriguing and leave me wanting to know more. I want to revisit my old friends and spend more time in their world. 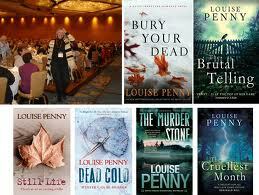 Here are a few of the mystery series that that I’ve enjoyed. Hopefully you’ll make a new friend or two as well! Maisie Dobbs by Jacqueline Winspear: A delightful yet serious young English woman whose life takes us from WWI, The War to End All Wars, begins with her time as a servant to a nurse and a solver of problems at home and in France. Donna Leon’s Guido Brunetti Mysteries: This “Commissario” of the Venetian Questura walks you all around the incredible city of Venice,introduces us to his treasured wife and children, while stopping for delectable meals and solving deadly crimes. The Joe Sandilands books by Barbara Cleverly: Beginning in India with “The Last Kashmiri Rose” follows the physically disfigured but hugely-hearted Joe from post Raj India across the world to England and France. Louise Penny, in her series featuring Chief Inspector Armand Gamache of the Sûreté du Québec, takes us to the tiny village of Three Pines and all of its fascinating characters, including the irascible Ruth and her duck . (Who would think that such an idyllic spot could have so many murders?) Always the devout husband, so in constant love with his wife, speaking French and English, Gamache is always involved with art and the history of the far eastern Canada and carries us with him. Bryant and May by Christopher Fowler: Ahhh, two “old guys”, one a grumpy and a luddite and his partner “older but still a dashing ladies’ man” are the original members of the Peculiar Crimes unit…cases that nobody else can solve or even WANT to try. This series is full of fabulous and eccentric characters that travel from World War II to Present Day London, above and below ground but always it is Bryant and May who carry the day. The “Charlie Moon” Series by James D. Doss brings us back to the”new” world of the American Southwest. Charlie, a Souther Ute policeman tangles with the world of the seen and unseen with advice from his traditional, Aunt Daisy Perika who sometimes appears comical but more often is far-seeing. A few others to look at but may be harder to find on shelf:The Amelia Peabody Series by Elizabeth Peters, Lady Victorian Archaeologist in Egypt. Who can resist Amelia, a twenty-something old maid who grows into a wife and mother with an anonymous stranger/admirer who haunts her yet protects her among the pyramids in the desert of Egypt. Amelia is what we all wish we could be…or have been in Victoria’s era.Steven Saylor’s, “Gordianus the Finder” wanders the streets of ancient Rome, finding out what really has happened in a number of incidents in which the city of Rome, herself, is a major character. With John Burdett’s outrageous “Royal Thai Detective” Series aka “Bangkok Series”, join Detective Sonchai Jittlecheep as he wades through the swirling underworld of Thailand battling vice and corruption as he tries to reconcile his Buddhist beliefs with his often violent profession. A wild ride! Another series that is a must for those who are willing to be lured into the land of Medieval Japan, is the wonderful I.J.Parker series whose character Sugawara Akitada investigates mysteries and inserts us into an ancient culture, beautiful but with an underlying dark side. You will be lured in and then CAPTURED.